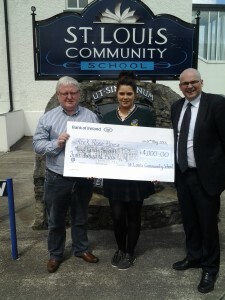 Pictured: Students with their teacher from Saint Louis School Kiltimagh presenting a cheque to Mayo Cancer Support Association Manager Padraic Barett. The students very generously donated money from a number of fundraising initiatives for Rock Rose House. Padraic Barett expressed his appreciation on behalf of Rock Rose House to all the staff and students.